The Toronto Transit Commission (TTC) is investigating after a passenger allegedly wouldn't give up a bus seat. Brenda Davie wrote on Facebook yesterday that she was taking the packed 72 Pape bus after work when she asked a passenger if he could remove his bag from a seat so that she could sit down. The man responded by saying, "No, my bag is there," according to her post. Davie asked him once more, pointing out that she had a headache. She then quoted him saying, "get the f*** away from me airhead the seat is occupied" and accused him of stomping on her foot and pushing her into a group of people. 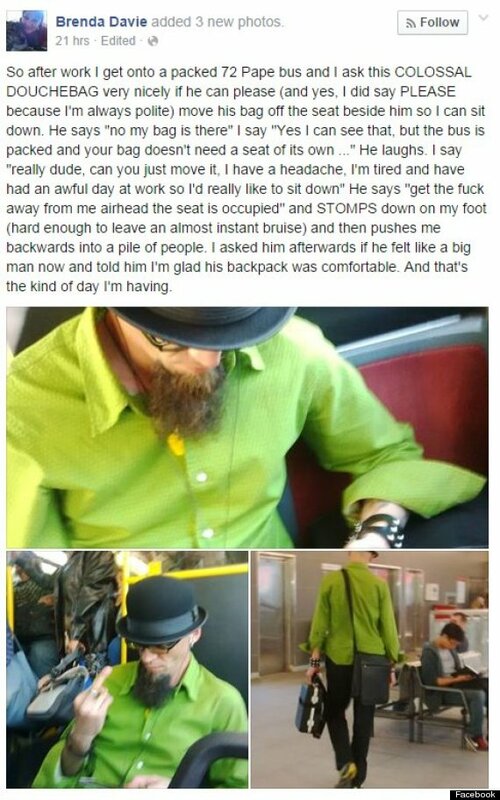 She took photos of the alleged assailant, which showed him wearing a bright green shirt, black pants, a bowler hat, thick-rimmed glasses and a goatee. One of the pictures shows him raising a middle finger. Davie's post has been shared over 7,200 times on Facebook and has even drawn the attention of the TTC, which is now probing the incident, CTV News reported. "I have advised (Davie) that police are aware as well, and if she wishes to pursue the incident with police then she should contact them. But we at the TTC are also looking into the matter," spokesman Brad Ross told the network. Davie, meanwhile, is very encouraged at the response that has followed her post. In a subsequent post she said her inbox was "flooded with messages" and thanked people for supporting her.